I’m sort of terrible at reading magazines. I subscribe to a lot of them and usually just end up flipping through them once. And then every once I find an article I keep coming back to. When I picked up the April issue of Family Fun and saw there was a whole feature on waffles? Instantly obsessed. Waffles are one of my go-to dinners for busy nights and they’re just happy food – which is exactly what we’ve needed around here lately. April was a doozey! These were really good. A fun take on chili with the flavor without the spoon – like a loaded up cornbread. And they’re one of those meatless meals where you just don’t miss the meat. The leftovers got happily gobbled up the next day for lunch – next time I’ll be doubling the recipe so they last longer! In a large mixing bowl, whisk together the cornmeal, flour, baking powder, garlic powder, onion powder and salt. In a separate bowl, stir together the eggs, buttermilk , oil and tomato paste until well combined. Stir the wet ingredients into the dry until well blended. Fold in kidney beans, cheddar, red bell pepper, corn and jalapenos. Heat a waffle iron on high and spray with non-stick spray. Pour 1/2 cup of the batter into the heated iron and cook until golden brown. Repeat until the batter is all used up. While the waffles cook, whisk together the sour cream and avocado until smooth. 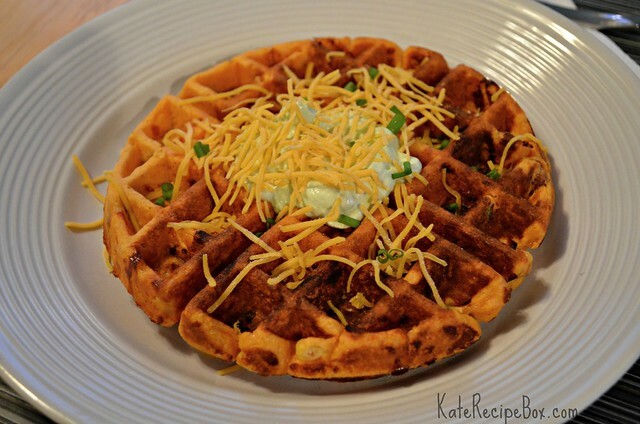 Serve the warm waffles topped with avocado cream, cheddar and scallions.